Vektanova - Human - Cat Translator makes cat angry! Animal Gallery Funny Gallery Gallery Human - Cat Translator makes cat angry! 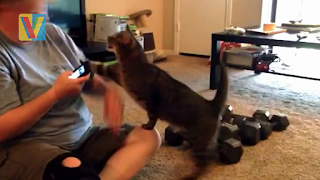 Human - Cat Translator makes cat angry! Title : Human - Cat Translator makes cat angry! Description : Human - Cat translator makes cat angry! Subscribe to Vektanova Human - Cat Translator makes cat angry! No response yet to "Human - Cat Translator makes cat angry!"